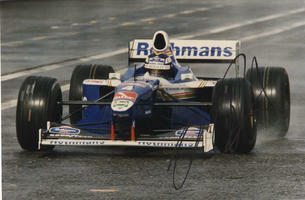 This is an In Person Signed Colour 12" x 8" Photo of the former German Formula 1 Driver. Heinz-Harald Frentzen (born May 18, 1967, in Munchengladbach) is a German racing driver most famous for his career in Formula One. At various times driving for Williams, Jordan, Sauber, Prost, and Arrows, he achieved three race wins before his retirement from F1 in 2003.